This quote comes from a report issued in June by an all-star group of business and government leaders, laying out the costs involved in higher temperatures and sea level rise. The section on the Southeast is especially likely to make you want to move north and west. Virginia has started to focus attention on rising sea levels because they are already taking a toll on Tidewater areas, regularly flooding neighborhoods in Norfolk and eating away at the Eastern Shore. In 2013, at the behest of the General Assembly, the Virginia Institute of Marine Science produced an in-depth report on sea level rise and our options for dealing with it. The report says southeast Virginia should expect another one to two feet of sea level rise by 2040, and up to 7.5 feet by the end of the century. We have our work cut out for us, but at least we’re facing up to it. By contrast, we have not yet begun planning for higher summer temperatures. As the Risky Business report warns, these higher temperatures will make much of the humid Southeast literally uninhabitable without air conditioning. And that has profound implications for our energy planning, starting now. More intense summer heatwaves will place additional stress on the electric grid and cause costly spikes in power demand. Power outages, today mostly an inconvenience, will become public health emergencies unless there are back-up sources of power readily available, such as solar PV systems with battery storage distributed throughout every community. Better building construction will be critical to keeping homes and businesses cool reliably and affordably. Since buildings last for many decades, we shouldn’t wait for summers to become deadly before we start mandating better insulation. It is vastly cheaper and more effective to build energy efficiency into a building than to retrofit it later. This makes it especially unfortunate that the McDonnell administration caved to the home builders’ association last year and did not adopt the updated residential building codes, which would have required these kinds of improvements in new additions to our housing stock. Governor McAuliffe’s failure to reverse the decision this year remains incomprehensible. 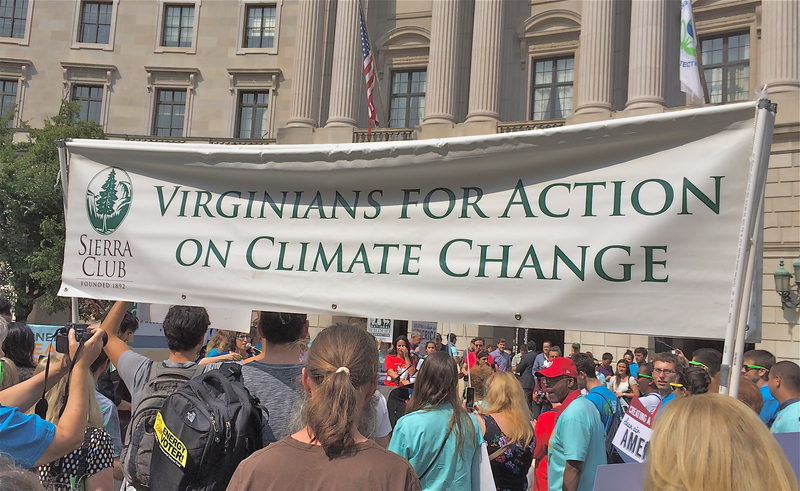 However, the McAuliffe administration is now engaged in three planning exercises that ultimately converge around Virginia’s future in a warming world. The Department of Mines, Minerals and Energy is currently writing an update to the Virginia Energy Plan as required by statue every four years, and which must be submitted to the General Assembly this October. On a slower track, a revived Climate Commission will begin conducting its work over the course of the next year. And most recently, the Department of Environmental Quality has announced listening sessions this summer focused on the U.S. EPA’s proposed climate rules. This timeline puts the (energy) cart before the (climate) horse. The writers of the Energy Plan will not have the benefit of the climate commission’s deliberations, and won’t know what the final EPA rules will require. With pressure from utilities, fossil fuel interests and home builders, business-as-usual thinking might prevail. That would be a mistake. We don’t know whether the worst extremes cited in the Risky Business report will become reality, or whether the U.S. and the rest of the world will manage to reduce greenhouse gas emissions enough to slow the rise of the oceans and check the worst of the heatwaves. But while we hope for the best, it makes sense to plan for the worst. And in this case, planning for the worst will also reduce the likelihood of it happening. If we improve building efficiency starting now, we will cut down on the emissions driving a Risky Business future. If our disaster preparedness includes solar panels on businesses and government buildings, we cut emissions and make the grid more resilient. Global warming has to be part of Virginia’s energy planning from now on. It’s just too risky to ignore it. This entry was posted in climate change, Solar and tagged climate change, energy, energy efficiency, McAuliffe, Risky Business, solar, VIMS, Virginia. Bookmark the permalink. While government (fed/st/local, and int’l) policy can make a big difference, I think we should celebrate how many individual, business, and institutional actors are choosing sustainable paths and conserving our natural resources. Not only diversifying our energy supply – I’m a particular fan of DG solar – but every efficiency action we take (e.g., using half paper towels) is a help.